When was the last time you got an item of clothing and became addicted to it? Tell me about it! That was exactly what happened when I got the Racer Back Jersey Maxi Dress from FD Avenue. I have a post coming up later in the week all about this dress but essentially, it is the most comfortable dress I own. I can dress it up or down and it has really encouraged me to mix and match items from my closet as I’ve worn it THAT much in just a few short weeks that I’ve really had to change it up so that people don’t think that I live in it… which I practically do. One of the easiest and most effortless ways to wear a plain black maxi dress like this one is to wear a kimono over it. The one that I’m wearing in todays post is from Lovedrobe by a brand called Koko. You can also buy this kimono from Curvissa. The Blue/Multi Floral Print Kimono is simply stunning as it has such an eye catching print that can only be fully appreciated in real life. The sheer fabric has a gorgeous print of dark and light cobalt blue hues with a floral design that is complimented by rust coloured hues. It really is a stand out piece that is perfect for late summer and autumn, especially if you’re into layering your fashion like I am. There is a double layer to the front of the kimono which is black. This is good if you’re wanted to wear it with a top that isn’t black because it helps to break up the colours between the kimono and the colour of the top you’re wearing. 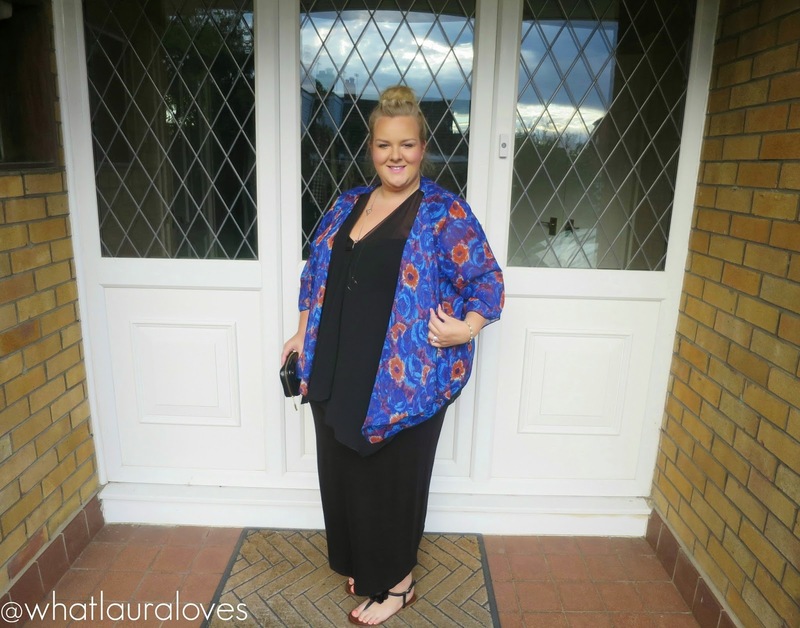 I’ve also worn this kimono over jeans (my favourite denim knitted leggings) and a white top. It looks great as the kimono has a gorgeous floaty shape and is quite long so it helps to skim over a multitude of sins. 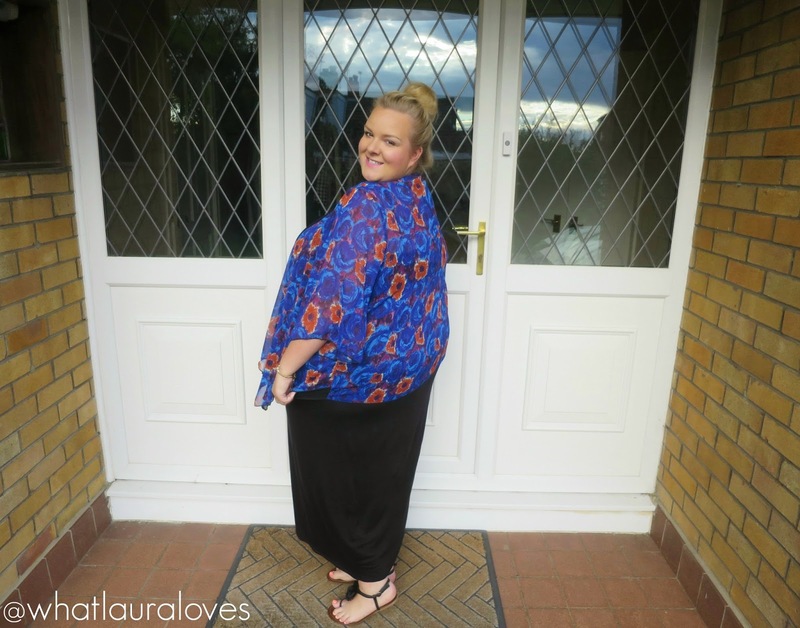 I did size up with this kimono as my stomach is a lot wider than my bust and I wanted a relaxed fit so that it would hang in a loose manner however the kimono is generously sized anyway so I needn’t have sized up at all. It is very comfortable to wear as it is light weight and the material feels breathable. This kimono is a great piece for taking your outfit from day to night as it really instantly makes an otherwise plain, casual outfit look that little bit more special. In this outfit post, we were heading out on a last minute date night to the cinema. I was already wearing this dress so I switched out my flip flops for some flat floral sandals and scraped my hair up into a top knot. Popping on the kimono and adding a clutch took my look from day to night straight away. If theres one metallic colour that I think goes well with blue, its gold. I love the way that the two work together so pairing gold details with this outfit was always going to be my first choice. My clutch and shoes are black with gold hard wear; I’m sure you’ve seen them many times on my blog. The stand out accessory that I’m wearing is my gorgeous gold tone beaded bracelet from the Michael Kors range at Harvey Nichols. 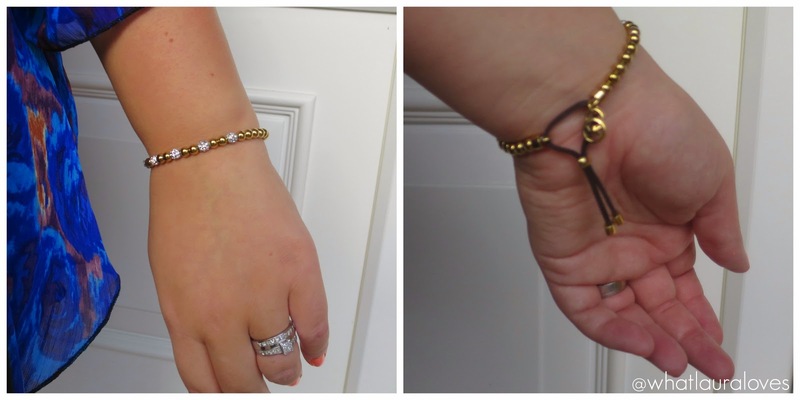 I love this bracelet because it is so dainty but eye catching at the same time. It is made up of small gold beads with four sparkly crystal beads positioned in between them, making the bracelet look so feminine and classy for a style that could be deemed quite casual. Plus it enables it to be worn with the white gold jewellery that I never take off, i.e. my wedding and engagement ring, without making them clash. The Michael Kors bracelet itself is elasticated so you can stretch it over your wrist without worrying about any fiddly catches. That’s the beauty about Michael Kors as a designer as the pieces that he creates are very easy to wear and classic. I also like that I am able to make the bracelet larger or tighter using the leather loop that again, has gold detailing on it and also the MK logo tag which is a nice touch. If you saw my Michael Kors haul from my honeymoon, you’ll know that Michael Kors is one of my most worn, iconic, all-American designers. This is one of my favourite pieces in my collection because it is minimalistic which makes it very wearable as a layering piece. While on the subject of pretty fashion pieces, I’ve been on the look out for a new watch for AGES. Basically, I want one to wear during the day as all of my other watches are either ceramic or covered in diamantes which aren’t particularly robust for during the day. I’ve seen the Daniel Wellington watches on a few different blog reviews but before I ask the birthday fairy for one, I was wondering if any of you had any recommendations for a casual, daytime watch? If so please leave them in the comments box for me to check out, failing that I’ll hopefully have a Daniel Wellington one on my wrist by my birthday*fingers crossed*. What are your favourite ways to style a kimono?